The courtroom showdown between Department of Justice and Apple that was scheduled for Tuesday has been postponed. The DOJ made the request after saying it may have found an alternative way into the iPhone used by Syed Farook, the gunman in the San Bernardino shooting. The DOJ has been pressuring Apple for help in gaining access to the iPhone. But in a court filing on Monday, the DOJ said it may no longer need assistance from Apple. "On Sunday, March 20, 2016, an outside party demonstrated to the FBI a possible method for unlocking Farook's iPhone...If the method is viable, it should eliminate the need for the assistance from Apple Inc," the document reads. Federal investigators want to see what data is available on the iPhone, but it is permanently locked. They can't try to guess the passcode, because if its self-destruct feature is turned on, it will erase its key after 10 incorrect passcode attempts. The FBI wants Apple to create special software that will let it bypass the phone's security protocols so it can try endless password combinations. Apple (AAPL) has been fighting that order. Its central argument: Removing the security protection in this case would create a "backdoor" that could potentially allow the government or hackers to break into similar iPhones. The government has argued that its request is focused solely on Farook's phone. "This was always about getting into a dead terrorist's phone," a senior US law enforcement official said in a conference call with reporters on Monday. "It's always been about this phone." A judge in February ruled Apple must comply with the government's request, and the DOJ and Apple were due back before that judge on Tuesday after a month of legal briefings. 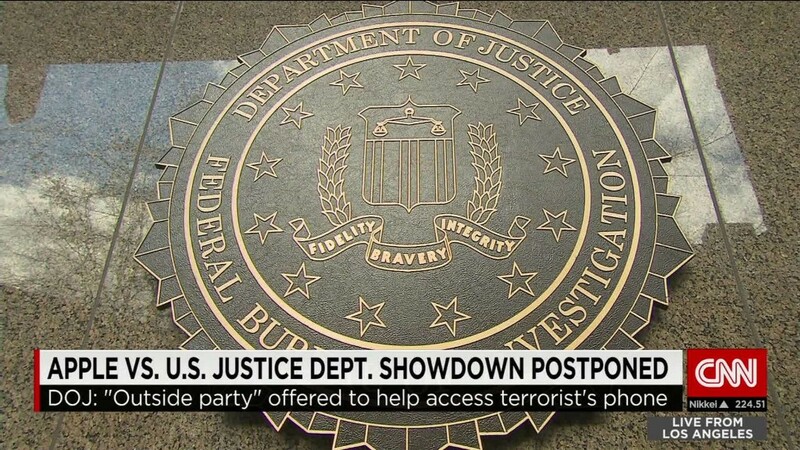 Now the DOJ will have a chance to test the method to break into the phone that an "outside party" has offered. The senior law enforcement official said the DOJ is "cautiously optimistic" the method will work, and it will notify the results to the judge by April 5. If the government is ultimately successful, it would point to a vulnerability in Apple's operating system. But Apple argues the government's new attempt to access the phone undercuts its stance that Apple's compliance was crucial. Apple lawyers said the FBI has provided no information on how it might gain access to the phone. The companies' lawyers said any vulnerability in the phone supports what it's been saying all along: That Apple is in an arms race against criminals who are looking for security gaps. In its filing on Monday, the government said it had continued looking for a way into the phone throughout its court battle with Apple, and that the possible new method was demonstrated to it on Sunday. Apple says it is constantly working to update its security features. And after its legal battle with the DOJ began, the company committed to developing a software so secure that even its own developers cannot break in.